are hanging on me like a sticky cobweb. I think that this past Thanksgiving was one of my best in years and I so enjoyed being at home and with my kids that it makes the Monday after Thanksgiving a complete let down. Bess and Tyler are gone. Clarice is back at college. Corm is back to his HS routine of leaving for swimming at 5:30 am, going to school and then home again after 5:30 pm....and Joe leaves today for France for the week. So it's me. And the dogs. At home. And while I do enjoy the peace and quiet it is still an adjustment. So, I have a book set aside to start reading. And several card ideas in my head to transfer to reality. I have a scrapbook page I would like to try laying out as well as putting my Fall decorations away and getting my Winter and Christmas decorations out and about the house. I did have some time this morning to work on a card. 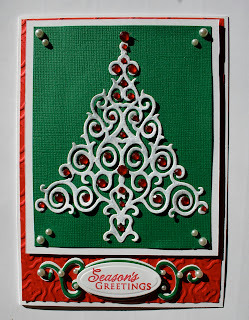 I had die cut the tree several days ago...on a scrappy-ish piece of paper. But then I experimented by outlining it with Stickles and suddently the scrap paper didn't look so bad anymore! So, I decided to keep the sparkly die cut and and make a card around it. I like how this card turned out but I think that I might like it better in the future if I use fancy Spellbinder die cut corners instead of pearls to accent the corners with. Seems to me to be too much "space" at the top of the tree. Any suggestions? Otherwise, I have embossed the red card stock and mounted the green sentiment tag on two white tags to give it "shadow" and definition. The sentiment is from the Hero Arts clear sheet of "Holiday Sayings" CL343. I think that this card looks a little more time intensive than it is....it actually came together really quickly! I hope you had a wonderful weekend.....and also have a good week out ahead of you. Love the diecut and all the bling! I don't think it needs a thing! Sheila, your card is wonderful. I think it is fine the way it is. It's so pretty. Hope you are feeling brighter soon. Looks perfect to me, Sheila! 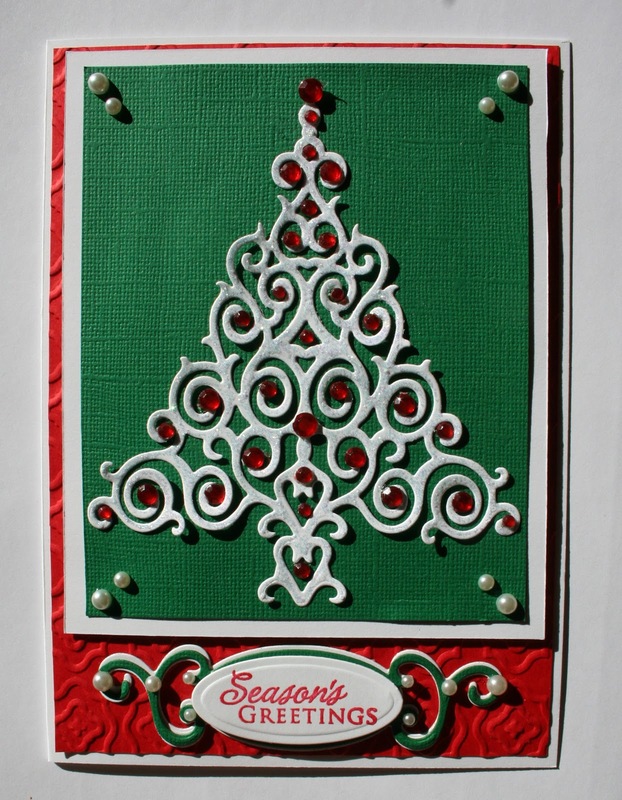 I love that pretty die cut tree. A delightful card Sheila. Looks stunning. I really like how this came out, Sheila. I sort of struggle with tree or triangle shapes because of the space at the top, but when I see yours it looks great! The way you did the sentiment is really special. Hope your blues fade away so you can enjoy your quiet time. Beautiful and intricate flourishes make this an eye-catching design! Chin up, girlfriend! You are so blessed with a wonderful family....seriously. I cherish my quiet time, but I understand the let down. Sounds like you have a good plan to keep busy. Love the elegance of this charmer, including the corners. That sentiment is delish, too. Wonderful! I think it looks good the way it is! I love that die cut tree with all the gems! So pretty!